It’s been just over forty years since Spielberg’s adaptation of Jaws (1975) introduced the great white shark (Carcharodon carcharias), a new monster, to the popular imagination. But this “monster” was not just the product of some fevered imagination, it was a part of the natural world that actually predates our own species by millions of years. What made the film work as a sharp thriller was partly due to the technical difficulties the director had with the mechanical shark “Bruce,” and many of the fright-cues took place by suggestion (due also in part to the John Williams score). It bears repeating–horror should include what we cannot see, at least until it’s too late to escape. I grew up on Nantucket. The Atlantic Ocean raised me. I stared at that Leviathan for hours, imagining remote, forbidden continents and the hidden forces of the deep. Around the time Jaws hit the screens, I was hearing The Beatles for the first time on my brother’s 8-track at the beach, wondering as a child and not quite sure what to make of life’s unknowns. My brain was very ripe for both the fear and awe thatJaws would inspire. What made this monster work so well? Well, consider the ocean, the habitat of the shark. Humanity merely uses the ocean. We encroach upon that habitat for commerce, travel, recreation, dumping our trash and toxic waste. In Jaws,this gigantic, sparky fish decides to encroach in turn, mining our coastal shallows for some chow. Jaws served up a not-so-gentle reminder that when it comes to humans battling an unrelenting force of nature, we know who comes out on top. It’s good to be reminded that our dominion is tenuous, at best. Plenty of ink (and blood) has been spilled on how Jaws shook up the Hollywood-studio model and essentially invented the summer blockbuster, so let’s focus instead that famous scene on board The Orca—The USS Indianapolis. At this point in the film, tensions between Brody, Hooper, and Quint have eased enough for them to compare scars, drink, and share stories. When Quint gives the solemn account of his survival after the sinking of The Indianapolis, floating defenselessly in the shark-infested Pacific Ocean, the story shifts gears to a deep universal resonance that grips our attention and doesn’t let go. Quint has faced this enemy before, with more intimacy than anyone else present. The experience taught Quint more about sharks in a week than most would care to know in a lifetime. His account also lends historical context and immediacy to the already taut narrative. Quint begins his story in a clinical, almost detached manner as any survivor of trauma might, and then he dives deeper with helpful details about how people might cope with that situation: the forming of tight groups, the fighting back, the screaming. But after all is said and done, nature and its hunger almost always win the fight. I also like how this scene reflects the intimacy of predator and prey. The eyes of the shark seem lifeless (although their senses are sharp as their teeth), he “don’t seem to be living ‘till he bites you.” Quint also admits he was most frightened as he was about to be rescued from the waters. Perhaps best of all, Quint’s account of his survival at sea emphasizes the very real threat of the monster he and his fellow hunters face, and how ill-equipped they are to conquer it. They need more than a bigger boat. They need a bomb. Larissa Glasser is a librarian and SF writer from Boston. She has previously published nonfiction and reviews in Harvard Review, The Boston Phoenix, and Maelstrom. She co-founded the Witching Metal band Hekseri and is a Member at Large of Broad Universe. She’s on Twitter @larissaeglasser. 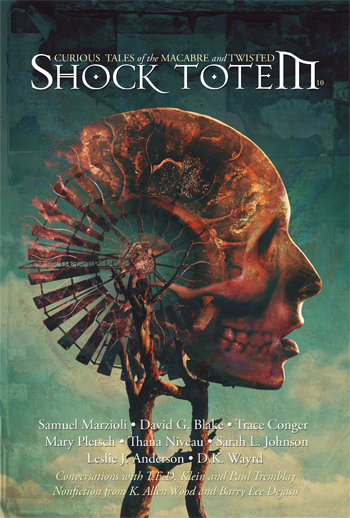 This coming Friday through Sunday, Shock Totem Publications (Sarah and I ) will be heading up to Portsmouth, New Hampshire, for the second annual Anthology conference (AnthoCon). We will have a table in the vendor room, which access to is FREE to the public! So stop on by. We’d love to meet you. Typical convention stuff will also ensue—panels, reading, pitch sessions, debauchery, etc. 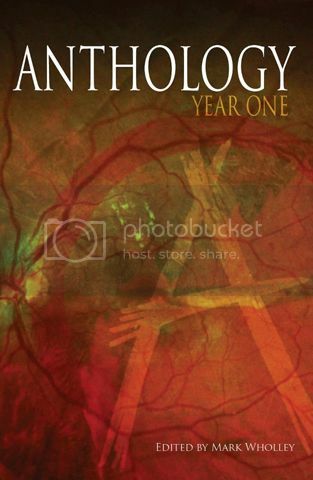 And on a personal note, The Four Horsemen will be unleashing their very first anthology, aptly titled Anthology: Year One. I am particularly excited about this because I have a story included called “She Cries.” The official release will be on Saturday at 6 PM. Many of the other authors will also be present for signings, maybe readings. So if you’re in the neighborhood, or looking for something to do this weekend, come to AnthoCon! And if you’re already planning to attend, we’ll see you there.